Hi guys! Welcome to my piCture pOlish giveaway! This giveaway is sponsored by piCture pOlish - 15 of us lucky ladies from the blog fest get to host giveaways for our readers! 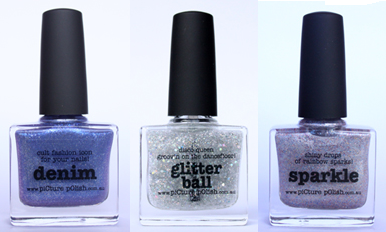 The lucky winner will get to pick THREE PICTURE POLISHES OF THEIR CHOICE! 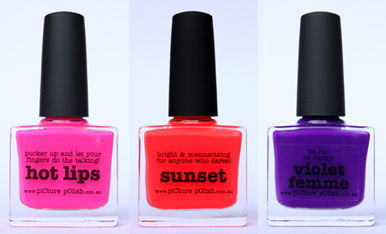 And piCure pOlish will ship them directly to the winner! What sorts of polishes can you choose? Head over to the piCture pOlish website and take a look! Or maybe you like neons! Of course, these are just suggestions. 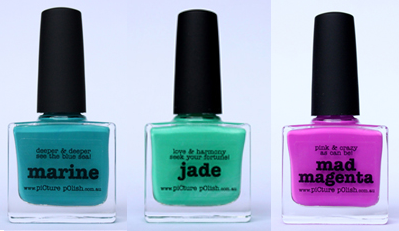 You can choose any three piCture pOlish shades you want. You may gain one extra entry by sharing this giveaway on your blog (post or page or sidebar,) on your Facebook (click here to share,) or on your Twitter (click here to tweet.) Please leave me a link. yay!! congratulations, im so excited for this giveaway!! I love the Wisteria! FIngers crossed! @a_plena yes you did enter darling! Rebecca I dont know if a have already enter can u tell me please dear ?